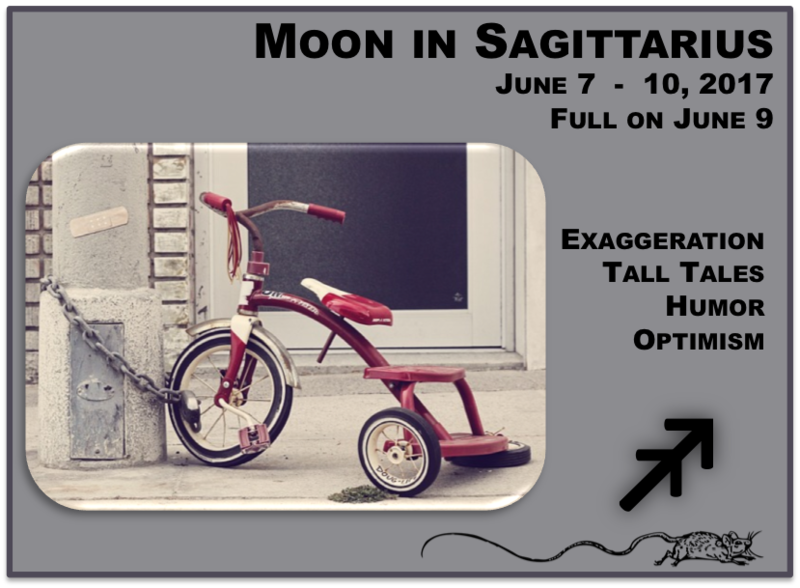 Moon in Sagittarius, June 7, 7:01pm – June 10, 7:37am EDT. Full Moon at 9:11am, June 9th. Most of us don’t lock up our trikes. The one in this pic made me think of PeeWee Herman’s 100% belief that his bike was the greatest bike in the whole entire world. Bigly. He has the best bike. Everyone says so. People are talking. That sense of proportion has its roots in Sagittarius and the expansive notions of bigger-than-life Jupiter. (Trump has Moon in Sagittarius, btw, and in the I am royalty Leo deacon and dwaad.) Whoever locked up this tricycle feels the same away about it as PeeWee feels about his bike. This has got to be the greatest trike in the whole, entire world. The grand storytelling is also the idea behind the very long tail of the mouse at the bottom of the pic. I do NOT think that Sagittarians are rats. I do think that if one of my Sadge friends told me a rat story, that it would be about the biggest rat EVER or, at least, the one with the longest tail. The Moon’s transit through Sagittarius begins on the 7th with an opposition to Mercury in Gemini. Lots of talk could be mostly superficial and maybe even defy true feelings. A sextile to ruler, Jupiter, on the 8th which should have the Archer Moon feeling right at home is complicated with a square to Neptune in Pisces. This is definitely Tall-Tale-ville. Can we really believe what we hear or see? The Full Moon on the 9th is crazy territory. As though Full Moons aren’t wacky enough sometimes, this one comes with Jupiter stationing direct. Jupiter is in Libra, so you might notice that growth is stalled for a while in your Libra house. That can be okay. A conjunction to Saturn helps steady the course and rein in anything expanding too quickly. Round about the midnight hour, the Sagittarius Moon trines Uranus in Aries. This is the Moon’s last aspect before entering the void period. Big, new ideas are the potential this aspect holds, if you aren’t afraid of a big, new adventure. 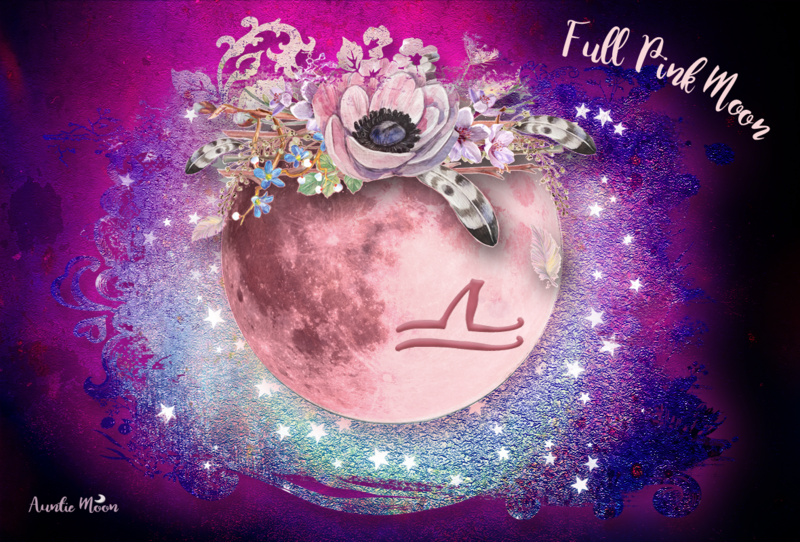 If you make Moon Water, the best night for the Sagittarius Full Moon is on the night of the 8th. 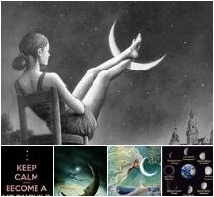 The Moon is exactly full on the 9th, but during the night she changes signs. By early morning, she has moved into Capricorn. The purest Sadge energy will be had on the night of the 8th. You made me smile, Holanda. Happy Full Moon!